To what extent are sites trying to bypass the filter of traditional media by becoming their own information outlets, controlled by the campaigns, and appealing to voters directly? The study assessed this by examining six different elements: candidate biographies, issue pages, links to mainstream news media reports, press releases, videos and the frequency of updates. All 19 candidate Web sites offer some kind of biographical page and a dedicated section on issues. Most also offer at least one other feature, though the depth of the information and the frequency with which new content is added varies a great deal. All told, the candidate Web sites really do serve as an information destination for the politically curious, with one important caveat. The campaign holds the editorial reins, and for that, most of the content is patently self-serving, generally highlighting the positive and ignoring the negative. Even when the candidates draw on the mainstream news for content, the selection of articles is always positive or, at most, neutral. The biographical sections allow the candidates to project the image of themselves they most prefer—their personal and public story about why they should be president. It is not surprising then that this is one element that all 19 candidates featured prominently on their sites, as one of the first items in the main menu-bar, or, on a few lesser known candidate sites, part of the home-page content itself. If running for president is about telling a story, this is where the candidates can do that. It is also why we choose this one area to further probe for their choice of words. What kind of stories do they tell? Other than at least some mention of spouse and family, the focus varies according to the areas each candidate wants to highlight. Arizona Senator John McCain, offers four subsections: his “Lifetime of Service,” in the Navy and the U.S. Congress, an interactive timeline, a section devoted to his wife (complete with recipes and “Cindy’s Journal”), and one to his family. New Mexico Governor Bill Richardson’s biography, expanded in late May, focuses on the different phases of his public service along with one section devoted to his wife. On the other hand, Republican and former Mayor of New York City, Rudy Giuliani keeps it simple with “Rudy’s Story,” just one section that tells of his different skills. There is one paragraph about his current wife. Tom Tancredo (R- Colorado) and Ron Paul (R- Texas) are the only candidates who offer their voting records in their otherwise brief biographies. Later in the report, we examine the use and avoidance of certain buzz words in campaign 2008. Issues were the only other feature common to all 19 candidate Web sites other than the biography pages—though Hillary Clinton didn’t add a section outlining her positions until late May. Issue pages are also an area that mainstream news Web sites have developed extensively in the last two election cycles—allowing users to compare candidates on an array of different issues. Here the candidate sites differ from those of news organizations. They don’t compare themselves to other candidates. They promote their agenda—what he or she would do to advance education, for example, or to end the Iraq War. Some issues are common to all candidates. All 19 candidates detail their position on Iraq, and all but one (Barack Obama) highlight a major element of domestic economic policy. Fifteen candidates discussed their position on the environment, global warming or energy policy. By this standard, the major issues as defined by the candidates are Iraq, the economy, the environment/energy policy, education, immigration, health care and abortion/family values. Issues that are not so prevalent include government reform/ethics in Washington, international trade, women’s rights, agriculture policy, judicial activism and public safety. Dennis Kucinich is the only candidate talking about animal rights and hemp. The clearest difference among the sites lies between the top-tier candidates with the most money and name recognition and those who are lesser-known. In general, the top candidates focus on fewer issues (six to 12) and talk more in depth about them. The lower-tier candidates tend to talk about more issues, and have less to say about them. Former Democratic Senator John Edwards, for instance, highlights just six issues, with special sections for three: health care, eliminating poverty and fighting global warming. In his section on health care, he provides a summary of his plan, a link to a document called the “Edwards Plan for Universal Health Care,” which is over 3,000 words long, and links to other articles and sources for more information. 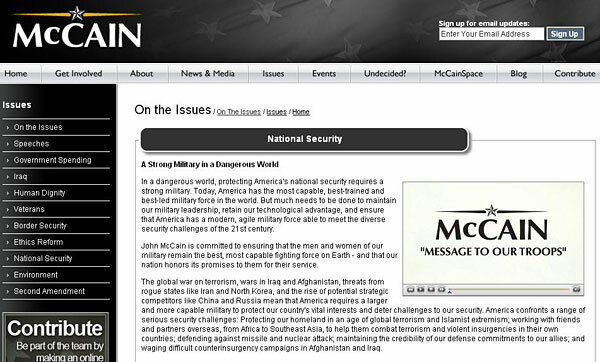 John McCain details his plan on nine issues, providing not just text, but also video and links to related speeches. He devoted the most text stating his position and plan on national security (2,203 words), and the least on his environmental position (364 words), with an average of 1,160 words across all nine issues. Each of his issue positions also has a video component to further articulate his stance. In the 12 issues he focuses on, Barack Obama goes on the longest about his plan for affordable and universal health care, with 3,000 words on his main issues page, a 15-page PDF of the details of his plan, a plan overview, a health care Q&A and a blog specifically targeted to discussing health care policy issues. Hillary Clinton, the latecomer to posting an issue section, is more abbreviated about policy. She devotes the most text (501 words) to the issue of women’s rights, followed by care for veterans (449 words). Nine of the ten issues that she highlights are accompanied by Webcasts in which she talks directly to a camera or video recordings of public speeches. Of all the frontrunners, Mitt Romney goes into the least detail on the 10 issue positions that he discusses. “Defeating the Jihadists” is the issue he highlights with the most depth, at 677 words. More than half of his issue content comes from brief news article quotes, and unlike most of the other frontrunners, he has no video in this section. Less popular candidates tend to talk about a much broader swath of issues but in minimal detail. Illinois Republican and entrepreneur John Cox mentions 18 separate policy issues, and Republican Senator Sam Brownback of Kansas and Republican congressman Tom Tancredo of Colorado talk about more than a dozen each. It is Democratic Congressman Dennis Kucinich of Ohio, however, who overshadows them all with 10 “key” issues and a staggering 81 sub-issues. Candidate Web sites are not entirely trying to bypass the mainstream press. All but one of the sites (Republican Governor Mike Huckabee of Arkansas), indeed, include mainstream news media articles in their content. But here the campaigns are the editors choosing which articles to publish. The news articles in general tend to feature the candidates’ positions on issues, their event schedules and sometimes, editorial praise of their performance and potential success as a candidate for the White House. Overall, the selected articles work to further promote the candidate. Recent news headlines on Obama’s site, for example, were a July 9 article from the Sacramento Bee, “Race for '08: Obama banks on charisma, ability to motivate” and a piece from The Oskaloosa Herald on the same day, “Obama: 'People are hungry for change.’” Similarly, McCain posted the June 29, 2007 National Review piece, “McCain’s courage,” by U.S. Senator Tom Coburn, “McCain’s Courage.” And Giuliani posted a June 30 Wall Street Journal article, “Of Tax Cuts and Terror: New York's former mayor makes his case to be Reagan's heir.” And for Clinton: “A Softer Hillary Emerging,” from the Foster's Daily Democrat on July 7, 2007. Sixteen of the sites have a specific section of the Web site generally called the “Newsroom,” “In the News” or simply, “Press” devoted to mainstream news articles. The news is usually drawn from newspapers, both local and national, and includes news reports as well as editorials. These same 16 candidate Web sites also post internally produced press releases of upcoming events or wrap-ups of recent events. The frequency of these posts varies and is discussed in more detail below. Generally, candidates update their press releases more often, especially the top-tier candidates. McCain, Mitt Romney (R-Massachusetts), Clinton and John Edwards (D-North Carolina) all add two to three press releases on their Web sites daily. When it came to news reports, John McCain did the most updating during the weeks monitored, with an average of four per day. Barack Obama and lesser recognized candidates Joe Biden and Jim Gilmore were the only other candidates to average at least two news stories a day. Nearly all of the candidates (17) showcase a video component on their front-page. Several of them even have branded ‘channels’ on their sites, where you can dig into their video archives. Such channels include: ‘BarackTV’ (Obama), ‘MittTV’ (Romney), ‘TomTV’ (Tancredo) and the upcoming ‘DTV’ (Chris Dodd). Note: Several candidates also have additional videos embedded in their blog posts, but these were not calculated in the totals here. Dodd, for instance, has more video found on his news media page, and alerts visitors that a video channel, "DTV," is coming soon. Again, it is the top-tier candidates that host the most: Mitt Romney hosts a staggering 131 videos, Barack Obama has 74, John Edwards has 70 and John McCain has 59. The exceptions to this rule were Dennis Kucinich (39 videos) and Tom Tancredo (35 videos). Lesser-known candidates like Duncan Hunter, James Gilmore and Mike Huckabee hosted fewer than ten videos. Tommy Thompson was the only candidate with no video as of June 12, 2007. How good are these sites at staying current, or adding new information for returning visitors? Despite fluctuations, the front runners tended to update their sites more often. Barack Obama had an average of about 6 new pieces per day and John Edwards’ site averaged almost 5 new pieces per day. Between May and June, Mitt Romney’s average rose, increasing from four to seven new pieces of new content. In a year in which immigration reform and English as an official language are issues, and the immigrant population continues to climb, some candidates are working to involve non-English speakers in the campaigns. Four of the 19 candidates offer visitors the option to translate some parts or the entire site into Spanish. This tool seems to be a Democratic strong point. Bill Richardson, Democratic Governor of New Mexico and the only Hispanic candidate in the running offers this Spanish version, and so do two of his Democratic rivals, Hillary Clinton and Barack Obama. Mitt Romney is the sole Republican to have a Spanish language option on his Web site. 1. Republican and former Virginia Governor Jim Gilmore and Republican U.S. Senator from Texas Ron Paul do not have designated places for archiving news articles featuring their candidacies, though Gilmore’s site does identify a “press center” which is “coming soon,” while Paul includes many mainstream news pieces on his blog. 2. 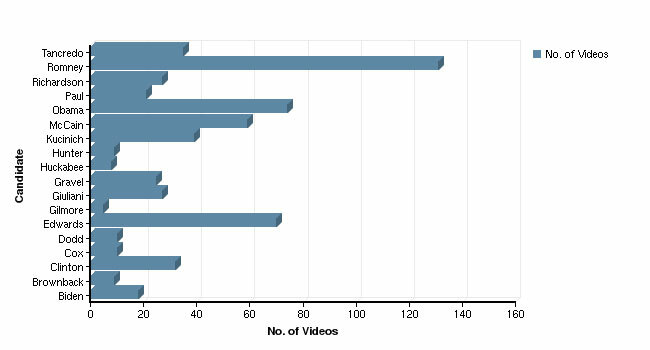 All video totals were tallied during the first week of June, and included all videos except those that were posted exclusively in blog entries. 3. Content pieces calculated here include mainstream news articles, press releases and blog posts. 4. In our May analysis, Chris Dodd (D) offered Spanish translations of some of his site, but it was no longer available in our June analysis.